Another truck crash on Oct. 20 along a small section of I-64 in West Virginia near the town of Institute was only the latest of several truck accidents in what is becoming known as a problem area. At 8 PM Oct. 20, a big rig flew over the embankment at mile marker 50, which closed the road for several hours. Fortunately, no one was hurt in this case, but other serious truck accidents have led to serious injuries. Four other accidents have occurred along that stretch since mid-August. 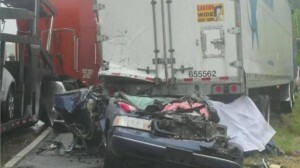 According to the state police, some of the truck accidents seem to be related to speed. There are signs there warning all drivers to slow to 55 mph due to a curve in the road there. Also, some of the truck crashes have happened in the rain. There have been 382 accidents on this stretch of three miles between Cross Lanes and Institute since early 2012. That actually is under the accident rate in the rest of the state, but the truck accidents are particularly alarming because they can lead to many injuries and deaths. The state police stressed that drivers need to obey the 55 mph speed limit in that area, especially truckers. Our trucking accident law firm sees new cases every month where negligent truckers drive too fast and cause serious accidents. We understand the pressures that truckers and their companies have to make profits, but public safety is paramount. We urge all truck drivers to obey speed limits, especially in curvy sections of the interstate in bad weather. We see many cases where small mistakes by truckers can kill. We handled a case in 2010 when a big rig slammed into the rear of our client, killing him. That trucker had had a medical issue due to not controlling his diabetes. We settled that case for $3.5 million.